This week we had the huge pleasure of being able to provide financial assistance to 11 families of children with a life limiting condition ranging in age from 4 months to 10 years of age across 8 counties . This we were able to do thanks to the largest ever single donation we have received. 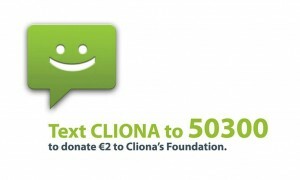 Cliona’s Foundation were humbled and delighted to be recently presented with a cheque for an amazing €26,328 from Finbarr Brougham, Chairman of the Limerick to Lourdes Charity Cycle group . 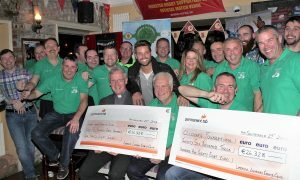 This represented 50% of the proceeds from the groups 800km cycle from Nantes to Lourdes in June of this year, the other beneficiary being the Limerick Lourdes Invalid Fund . Speaking at the event Brendan Ring CEO of Cliona’s Foundation and also one of the team of 19 that undertook the mammoth task spoke of the massive appreciation and admiration of the efforts and sacrifices involved in raising this record amount and the impact it would have on families struggling to deal with the many issues of having a child with a life limiting condition . Cliona’s Foundation were delighted to be able to personally thank the team of cyclists including Keith Duffy who paid a surprise visit to Limerick specifically for the cheque presentation despite his very hectic schedule with Boyzlife.